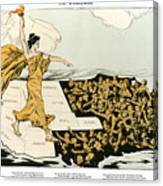 Queen duvet cover (88" x 88") featuring the image "Womens Suffrage, 1915" by Granger. Our soft microfiber duvet covers are hand sewn and include a hidden zipper for easy washing and assembly. Your selected image is printed on the top surface with a soft white surface underneath. All duvet covers are machine washable with cold water and a mild detergent. There are no comments for Womens Suffrage, 1915. Click here to post the first comment. 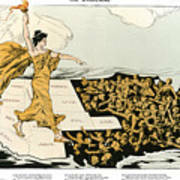 WOMEN'S SUFFRAGE, 1915. 'The Awakening.' 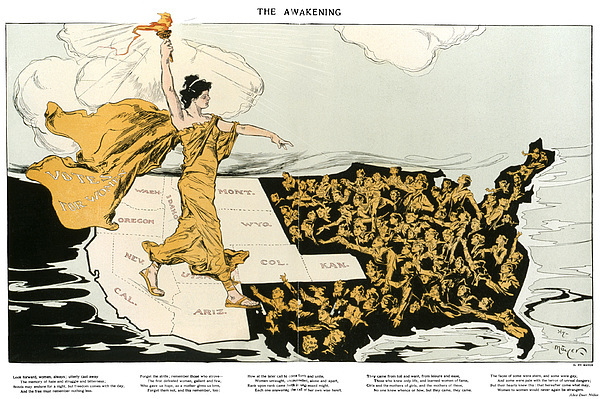 American cartoon, 1915, by Henry Mayer, showing an allegorical representation of the suffrage cause striding across the western states, where women already had the right to vote, toward the east, where women are reaching out to her. Printed below the cartoon is a poem by Alice Duer Miller.